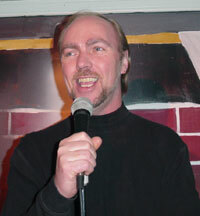 "As Funny As I Never Was"
Gary Thison's hilarious stand-up comedy CD recorded live. This comedy club performance was recorded live at the Historic Holly Hotel. Comedy monologues, jokes and audience interaction make this a great addition to any comedy collection. Now, you can enjoy this outrageously funny comedy performance in your home or car for a mere $8.00 (shipping included). Some material is not suited for little kids or people who are offended by talking like most of us talk anyway. Buy the CD! Steal the jokes. People will think YOU are funny! Comedy bits include: Deer Hunting, Getting a Vasectomy, Inflatable Doll, Humor in the Bathroom, Fatherhood and more. Nine hysterical tracks in all. Listen to the "Deer Hunting" bit. Click here! Only $8.00! Free shipping for limited time. Laugh all the way to the bank with huge jackpots wins when you play at a casino online.